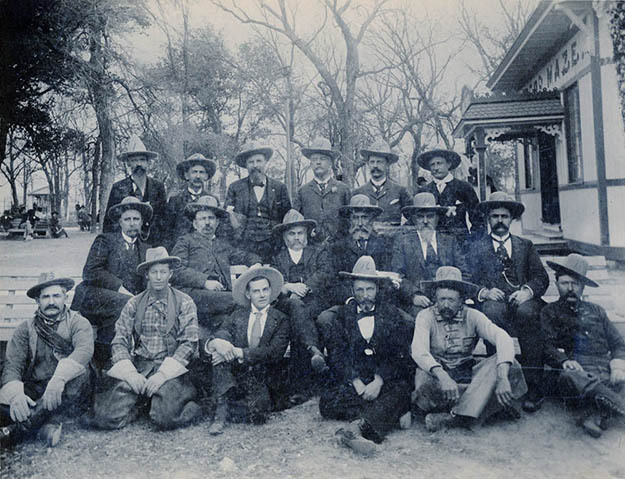 All images courtesy of The Texas Collection, Baylor University. 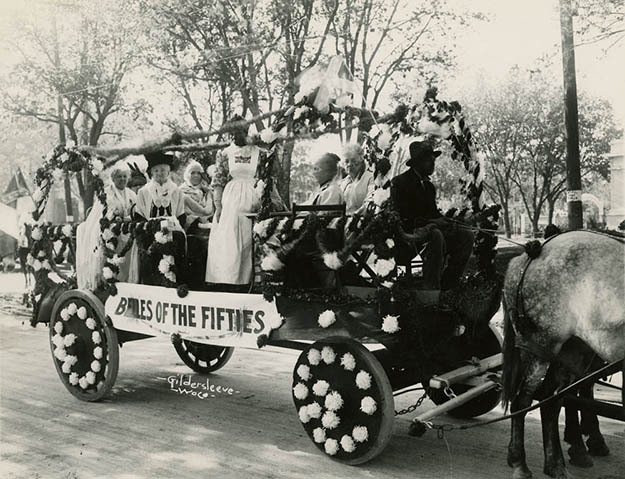 On June 22, 1894, factory whistles sounded and the church bells of Waco rang out in celebration as a two-hundred-float parade made its way to Padgitt Park for the Texas Cotton Palace’s cornerstone-laying ceremony. Thanks to a public subscription campaign, Waco residents raised $40,000 to finance the construction of the exhibit hall. It was a fitting beginning for an exposition designed to be as much an expression of civic pride as a tribute to the region’s cotton industry. The Texas Cotton Palace opened on November 8, 1894. It featured a multitude of exhibits and an exciting midway. Although no record remains of its gate receipts, locals recall it being a resounding success. Sadly, this triumph was to be short-lived, as on January 19, 1895, a fire laid waste to the main auditorium. 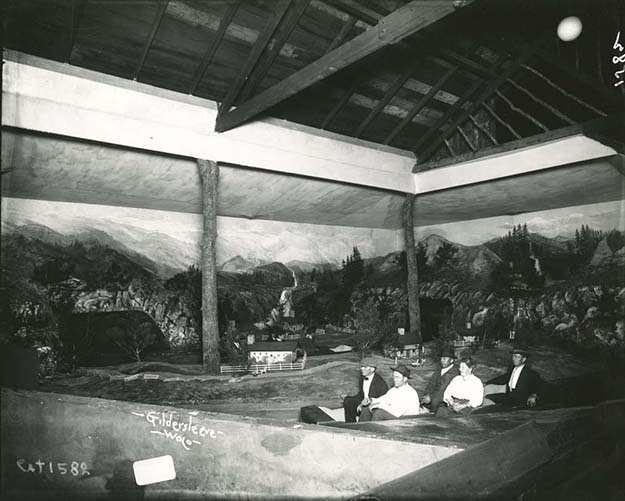 The Cotton Palace remained a pleasant memory until 1910, when it was reborn through community efforts. 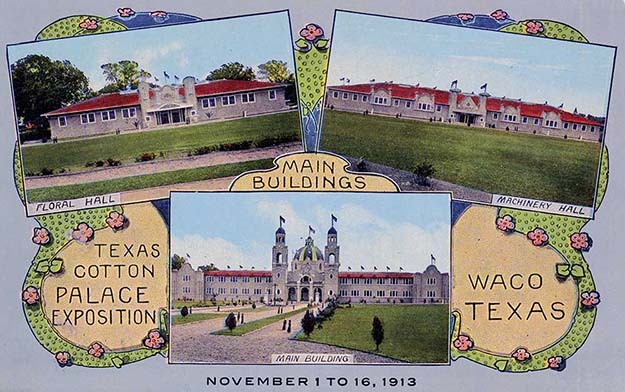 The rebuilt Texas Cotton Palace sported grander facilities on a triangle-shaped, twelve-acre lot bordered by Clay Avenue, Dutton Avenue, and South Sixteenth Street. The Main Hall featured a magnificent central dome flanked by two stately turrets. Equally impressive was the exposition’s 10,000-seat-capacity coliseum constructed to house the Cotton Palace’s numerous concerts, plays, and pageants. 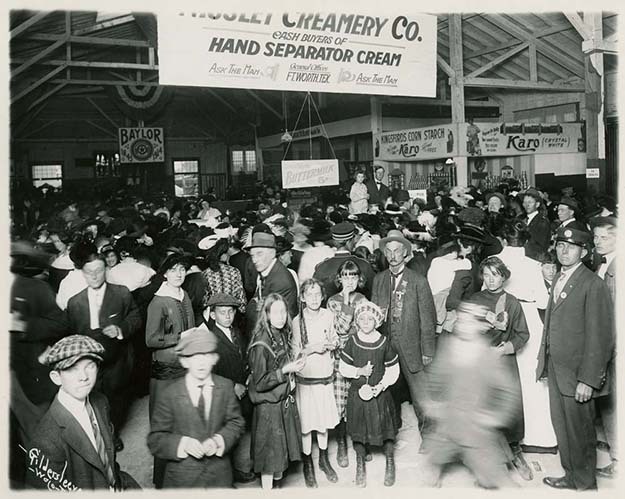 The Floral and Machinery Halls contained the event’s exhibits. These permanent buildings were augmented by a race track, barns, and a carnival area. 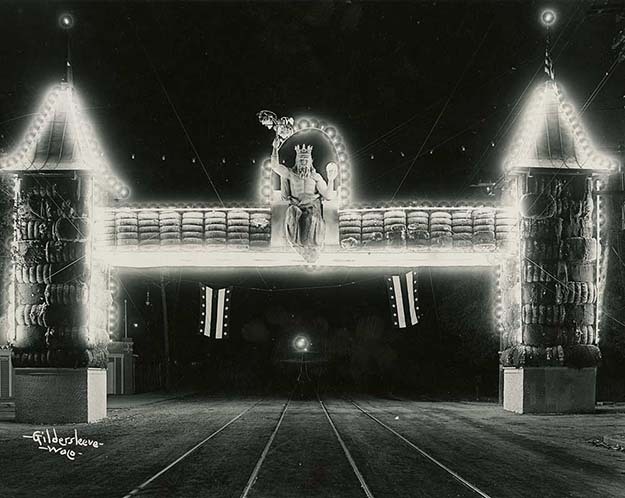 The carnival section, known as the War Path, included a Ferris wheel and wooden roller coaster. 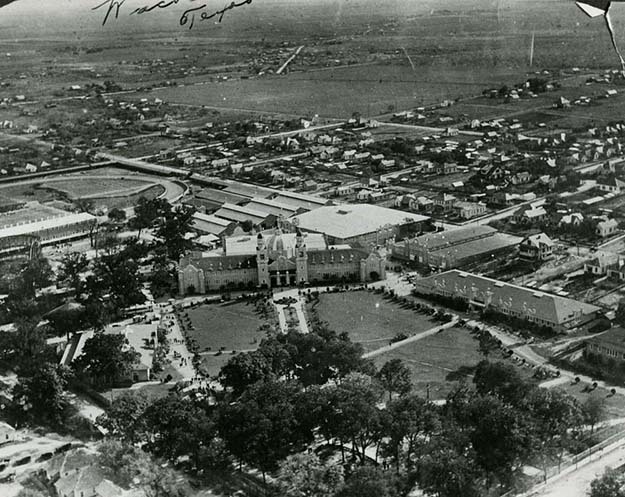 By the 1920s, the grounds expanded to include further green space and an athletic field with an 18,000-seat grandstand used to stage football games between top Texas college teams. While excellent amenities and fair activities did much to attract crowds to the Cotton Palace, so too did the promise of spectacle. 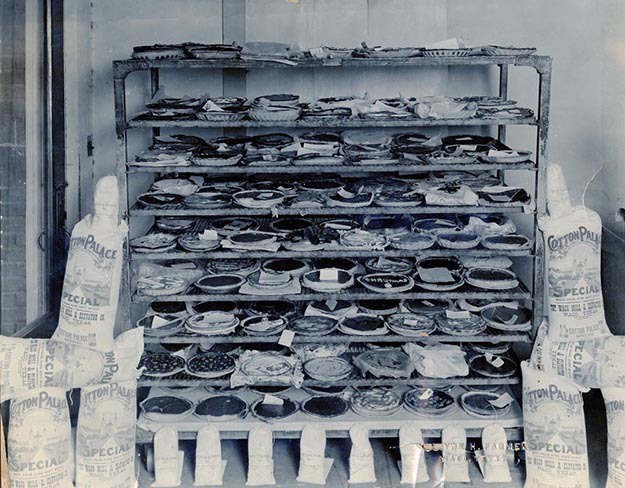 Activities at the two-week-long exposition included elaborate art exhibits, dairy and poultry shows, horse and automobile/motorcycle races, and competitions for outstanding examples of handwork, canning, preserving, and baking. However, it was the exposition’s elaborate parades, theme days, and regal pageants that set the Cotton Palace apart from other state fairs. 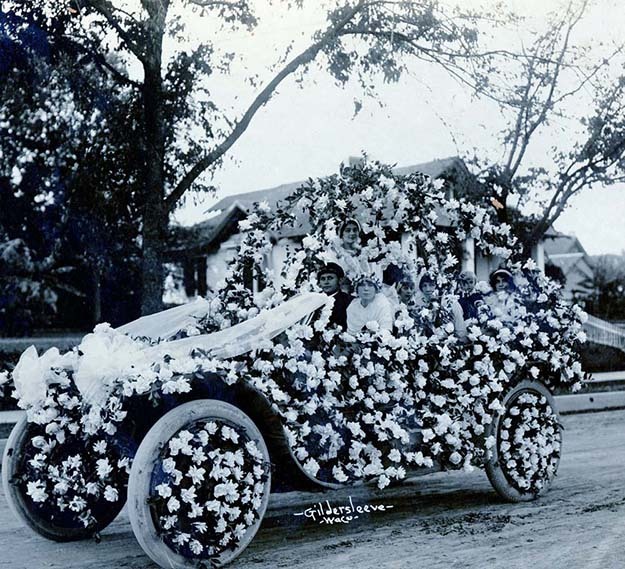 Each year thousands of local spectators and out-of-state dignitaries attended the coronation ball of King and Queen Cotton. 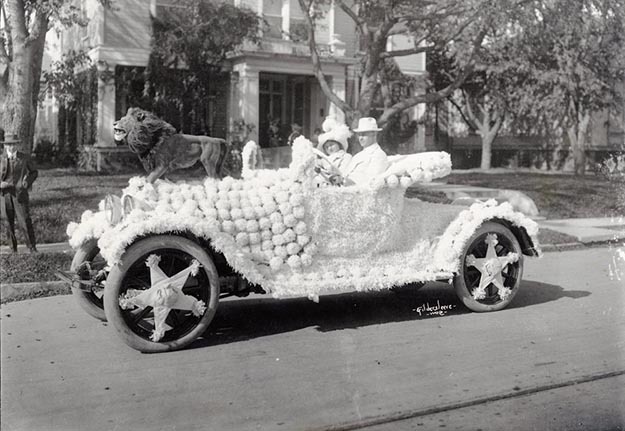 Lavishly decorated to emulate the courts of great past empires (Rome, Persia, and China, to name but a few), organizers used the opulent coronation ball to demonstrate Waco’s economic prosperity and to emphasize the rightful place of its cotton empire alongside the civilized powers of old. In 1917, the Cotton Palace’s usual spectacles were adapted to suit the curiosities of a nation at war. 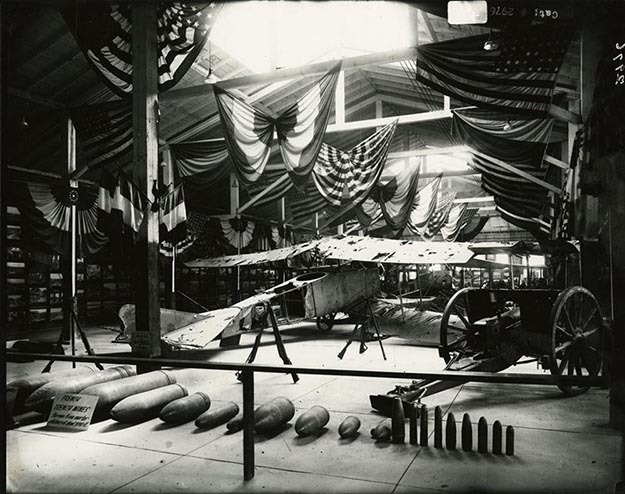 An entire exhibition hall was set aside to display items from the Western Front such as a captured German biplane and French artillery pieces. Organizers recreated historic naval clashes with fireworks. They also invited thousands of soldiers from Camp MacArthur to take part in daily sham battles for the purpose of demonstrating modern warfare tactics to rapt audiences. 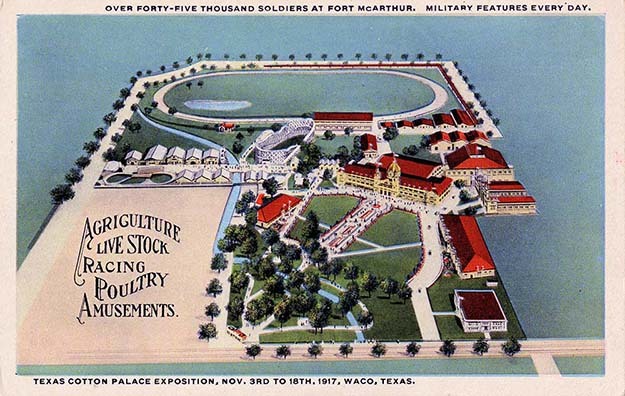 A record number of 547,242 people attended the exposition in 1918, the large turnout likely due to the draw of the war exhibits and the influx of personnel from Camp MacArthur. Attendance would continue to be high throughout the 1920s. On November 3, 1923, a single day’s record was set at 117,208. Even with the economic downturn of 1930, there was an overall attendance of 350,000. Unfortunately, the decline of the cotton market and the economic crisis brought on by the Great Depression meant these numbers were not sustainable. 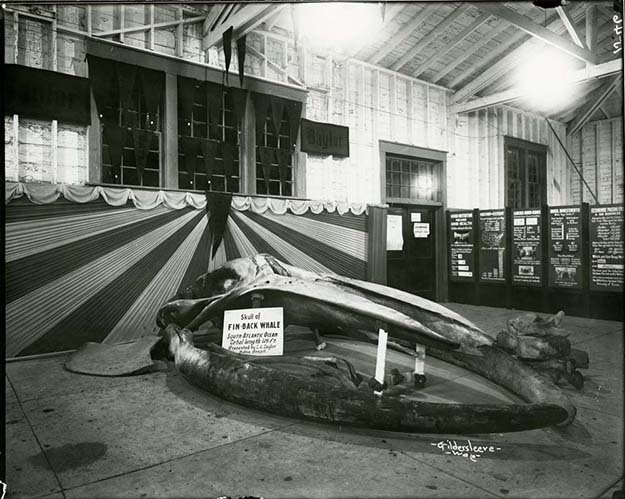 The Texas Cotton Palace closed its gates for good after the 1930 exposition. Today, the spirit of the Texas Cotton Palace is kept alive through both the annual Waco Cotton Palace Pageant and a musical revue that recaps the fair’s fascinating history. 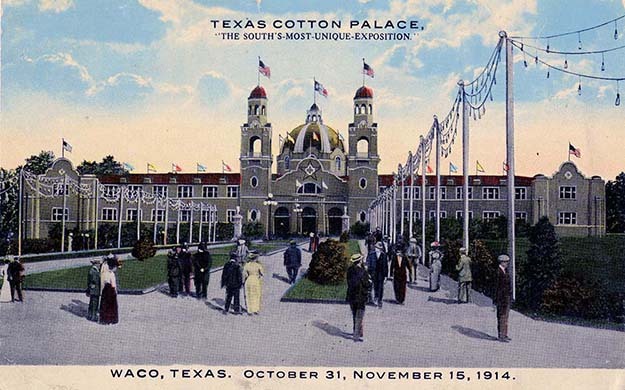 The Texas Cotton Palace will always be remembered as the event that officially signaled Waco’s transition from a remote cattle outpost to a prosperous urban center capable of hosting a world-class exposition.